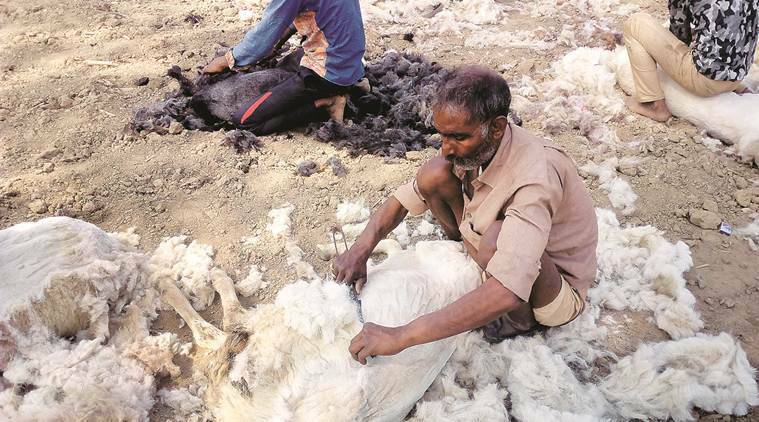 Sheep rearer Yashpal Singh of Mugal Majra, Saharanpur, shearing wool from his sheep. “Bhed na bikey, Oon na bikey, Vote BJP ko (Our sheep or wool may not sell, but our vote is for the BJP).” That’s Yashpal Singh of Mugal Majra village in Rampur Maniharan tehsil of Saharanpur district. And this 55-year-old largely reflects the views of his Gadaria or Pal community which rear sheep and goat for wool, meat and milk. “Four years ago, our wool (each sheep yields about 3 kg annually over three shearings) was selling at Rs 30 per kg. Now, it is given almost free, as blanket makers in Panipat have switched to imported wool or synthetic material from China. Today, we earn only from animal sales for meat. A four-month-old, weighing 15-20 kg, fetches Rs 7,500-8,000, while it is around Rs 12,000 for a one-year-old 65-70 kg animal,” says Yashpal who rears 70 sheep and owns no land. Mugal Majra has roughly 100 Gadaria voters, besides 600-odd Jatav Dalits and 400 Sainis. “The Dalits are going with the BSP. Pals and Sainis will vote for Raghav Lakhanpal (the BJP candidate and sitting MP from Saharanpur),” declares 19-year-old Abhishek who studies at the Government Industrial Training Institute in Sarsawa, near Saharanpur. Has the BJP government done anything for Gadarias? “No. You get bank loans for rearing cows, buffaloes, poultry and even pigs, but not for goats and sheep. All that BJP has given us is izzat (dignity), but because of that we can today walk with our head held high,” says Balram Pal (31), who keeps 65 sheep. A similar sentiment is echoed by Krishan, a kolhu (jaggery unit) operator who belongs to the Kashyap or Jhimar caste. Traditionally water-carriers and agricultural labourers, many of them now own kolhus, procuring sugarcane from farmers and converting it into gur (jaggery) or shakkar (cottage sugar). “This government promised Rs 12,000 to build toilets in our homes. Instead, they supplied material worth Rs 7,000,” complains Krishan, whose kolhu is on his meagre 1.5-bigha (0.25 acres) land. Yet, the Kashyaps of his village, Kurdi Nangal in Baghpat’s Chhaprauli tehsil, support the BJP. The reason: “Hamein pehle koi nahi poochta tha. BJP utna toh karti hai (Earlier, nobody even counted us, the BJP at least does that)”. It is the numerically and socially not-so-dominant communities — Kashyap, Gadaria, Jogi (originally mendicants, also called Nath or Upadhyay), Prajapati or Kumhar (potters), Badhai (animal cart makers and carpenters), Lohar (blacksmiths) and Sunar (goldsmiths) — along with agrarian castes specialising in vegetable farming (Saini/Mali) and dairying (Gujjar) that have increasingly become part of BJP’s “core” vote-bank. “We account for 2,100 out of Jharkheri’s 2,500 voters, and are equally large in Panjeth and Kishorpur (all villages in Shamli district’s Kairana tehsil). All our votes are ek tarfa (one-sided) for BJP,” says Neeraj Saini (21), currently training with his friends to join the army, paramilitary or police force. These communities may be smaller in numbers than Jats, Muslims and Jatavs — who seem inclined towards the BSP-SP-RLD alliance — but can tilt the balance in the eight western UP Lok Sabha seats that vote on April 11. Take Kairana, where Muslims (5.25 lakh), Dalits (3 lakh, 90 per cent of them Jatavs) and Jats (1.7-1.8 lakh) constitute a majority of its total electorate of 16.5 lakh. But this constituency also has some 1.25-1.35 lakh each of Kashyaps, Sainis and Gujjars, apart from Brahmins (65,000), Banias (60,000) and Rajputs (30,000) who are considered pro-BJP. The same goes for Muzaffarnagar’s 16.90 lakh voters that include five lakh Muslims, 1.75 lakh Jats, Jatavs and Kashyaps (1.5 lakh each), Sainis and Rajputs (1.25 lakh each), one lakh Banias, and 50,000-60,000 each of Gujjars, Gadarias, Tyagis and other Dalit castes (Valmiki, Khatik and Kori/Julaha). In the event of the Muslim vote splitting (Saharanpur) or the Jats not fully backing a Muslim SP candidate (Kairana), it is the so-called non-dominant rural castes that can make the difference between winning and losing. “The BJP has reached out to these communities, including non-Jatav Dalits, and given them an identity as Hindus. The Jats have mostly gone back to RLD after voting as Hindus in 2014, but the others are still solidly behind the BJP,” says Rajvir Singh Mundet, a Shamli-based social worker. The Kashyaps, Badhais, Lohars and Koris (weavers) traditionally worked as labourers or service providers for Jat farmers, who even cast votes on their behalf. “That equation has changed. Today, a family of four labourers can together earn Rs 900-1,200 daily, which is more than what a cane farmer makes. Also, the delay in receiving payments from mills or damage to crops from stray cattle has hit farmers much harder. As a result, the gap between Jats and other castes has considerably reduced. Sainis and Gujjars, too, are unwilling to accept Jat dominance,” says Mundet. For Sompal Tomar, a 27-year-old Jat farmer from Bamnauli village in Baghpat’s Baraut tehsil, the only issues in this time’s elections are ganna (sugarcane) and gai (cattle). “In 2014, 80 per cent of Jats, who account for half of our village’s 7,000 votes, backed BJP’s Satya Pal Singh. This time, we will not allow him to even enter here. Forget doubling our incomes, we have been made beggars,” says Tomar. He hasn’t been paid for the cane he delivered to a sugar Mill in Malakpur after December 2.